These finger strengthening exercises will help you develop a grip like wire cables tightening. Whatever you're grabbing will not be able to get away. 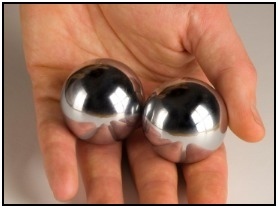 Single finger lifting and Chinese iron balls both have a history of producing strong fingers, though from radically different cultures. Use either of them or both - whatever floats your boat for getting stronger fingers. 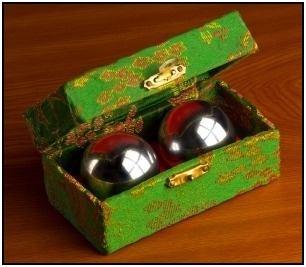 Known in Chinese as Bǎodìng Jiàn​shēn Qiú​​ (保定健身球), or simply Baoding balls, these have been used for finger strengthening exercises and as therapy tools for some time. Allegedly originating in the Ming Dynasty (1368 - 1644), these balls have been used by martial artists who want healthy hands for at least the last few hundred years. The lighter ones are great for hand dexterity exercises and the heavier ones are great for strength training. You can get them at most Chinese goods stores. They are usually chrome plated with hollow insides, these days sometimes filled with bells. Make sure you're going for ones that are heavy, if you're going for strength training rather than just keeping your hands healthy. If you can't find them, try online or just go to your local hardware store and find the fishing weights. While not beautiful, spherical fishing weights are heavy and can certainly work for hand strengthening. Start with two that you can rotate in a simple circle in your hand. Once you've got that down, start adding more balls and/or making them larger and heavier. Once you're really good at that one, try doing rotations with your handspalm downward. This takes much more control and strength than the regular palm upward version. Try it only if you what something extremely advanced. Single finger lifting has a unique status among finger strengthening exercises. It's damn impressive to lift several hundred pounds with one finger - and easier to show off than rotating heavy iron balls. But you have to go about it correctly. Injured and busted fingers are no fun. I got these guidelines for single finger lifting from John Brookfield's The Grip Master's Manual. He's a specialist in grip training and I trust his advice most, particularly for this dangerous lift. Next, get your weights together. Regular barbell weight plates are convenient, and using a chain to bind them together works well. So you lift the chain with your finger to lift the plates. Pick the weight up and then place it down, or hold it elevated for as long as you can. The movement of this lift will come from you straightening up your back and extending your legs to stand up. Try the lift with your middle finger first, which will be a good place to start. Only try other fingers, such as your little finger, after you've already got the hang of single finger lifting on your middle one. But do try other fingers - 5 strong fingers are way better than one. So start light, even if you have significant hand strength developed from other exercises. Ideally you will have already done at least some basic weight training. You're developing primarily tendon strength in your finger(s), which takes longer to develop than muscle strength. And don't be afraid to use extra cloth to pad your finger when doing your finger strengthening exercises. This is smart, and won't interfere with your lifting. • Click here to leave 'Effective Finger Strengthening Exercises' & go back to the Complete Strength Training Home-page! 1. Brookfield, John. 2002. The Grip Master's Manual. Nevada City, CA: IronMind Enterprises. Pp. 43.